The patio is open for the summer! Looking for the perfect place to enjoy a cocktail and lite bite during a day of shopping downtown? Need to unwind after a long day at work and catch up with some of your friends? Are you celebrating a special day? 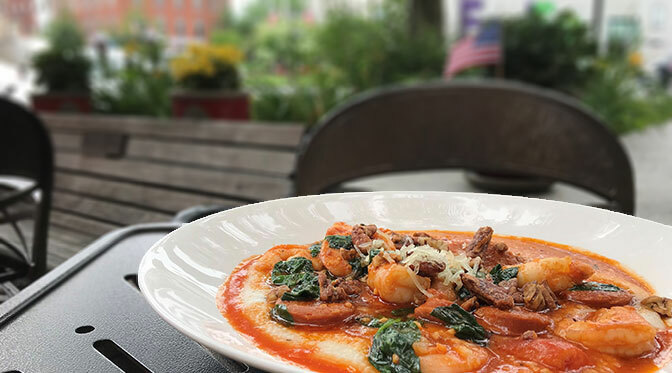 Chef Holmes has been hard at work creating new menus for you to enjoy this summer on the patio overlooking Lincoln Square in downtown Gettysburg! The locally inspired and sourced menus have something for everyone. Breakfast features a wide variety of pancakes (Adams County Apple, Black and White), Bananas Foster French Toast, traditional Eggs Benedict, and so much more. Lunch has salads, sandwiches, and delicious entrées like Shrimp and Grits. Stop by for a quick lite bite from our bar menu such as Grilled and Chilled Shrimp, Short Rib Flatbread, or Avocado Bruschetta. Dinner is a show stopper with dishes like our famous One Lincoln Crab Mac & Cheese, Citrus Glazed Duck, and Pan Seared Salmon with Gnocchi. We look forward to hosting you this summer in downtown Gettysburg.